The Furniture Warehouse - Great Furniture. Better Prices. The Furniture Warehouse opened its doors in 1988 in Sarasota, FL as a warehouse operation. Our low prices, coastal and diverse options, and next day deliveries have contributed to our company’s fast growth in Southwest Florida. We now have stores Ellenton, Bradenton, Sarasota, Venice and Port Charlotte. We have everything you need for your home at affordable prices! Our purchasing team has stayed true to the warehouse mentality and always strives to find the best deals. The Furniture Warehouse’s manageable size allows us to buy large quantities to compete with national retail chains, and the option to purchase high quality close outs in quantities these national brands simply cannot. In our Warehouse, we stock everything on the floor. We have same day pick up or next day local delivery from our state of the art Warehouse facility. We ship across the US. We buy with Big Savings for our customers daily and pass these savings onto them. We believe in treating our customers like family. The Furniture Warehouse would not be here without the support of our loyal customers, and our customer service department reflects this. We always strive to make every situation right. 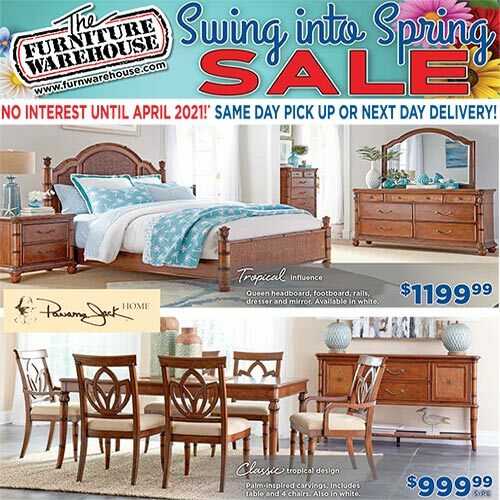 Come in and shop The Furniture Warehouse Way! The hassle-free showroom allows our guests to browse the showroom floor and always feel at home. Our sales staff are inviting, friendly, knowledgeable, and always ready to help. The large and efficient warehouse allows for same day pick-ups, and a next day white-glove delivery service that is top rated. At the Furniture Warehouse, there’s no price gimmicks or phony advertising. Drive to one of our five locations any day of the week, and you will find fashionable pieces that appeal to your personal styles and know it’s at a warehouse price. Whether its relaxing bedrooms, casual or formal dining rooms, or inviting livings rooms, shop online www.furnwarehouse.com with confidence at one of Florida’s Most Trusted Retailers. We ship fast to the lower 48 states. For a free quote, outside of our normal delivery area, complete an online shopping cart form. We strive to do our best to help resolve issues and answer questions. Our staff is available to help you. On some occasions, a service professional may come to your home and observe the furniture to determine the problem or issue. We do this in an effort to offer the best possible customer service. We Have a strong commitment to the communities. The Furniture Warehouse has a strong commitment to the communities in which they serve and are proud to partner with such worthwhile organizations as Habitat for Humanity and the all Faiths Food Bank with several annual events. Our Habitat for Humanity event happens three times a year in February, October and December. Customers donate a piece of furniture that is “gently used” and receive a discount on the purchase of new furniture at The Furniture Warehouse and receive a “tax donation slip” for their generosity. We organize these events during season when there is a greater need for our less fortunate community residents. Our Food Bank event happens three times a year in January, March and November. With a donation of imperishable foods, our customers receive a discount on a purchase of new furniture at The Furniture Warehouse. It allows the local food banks to “stock their shelves” that fulfil the needs of the community at the highest demand times of the year. Events for the University of South Florida offer our customers an opportunity to know that a portion of their purchases go towards scholarships for students that seek an education in our local college. The best feature of these events for our customers is the satisfaction they receive of knowing they have helped a resident in need within their own community.